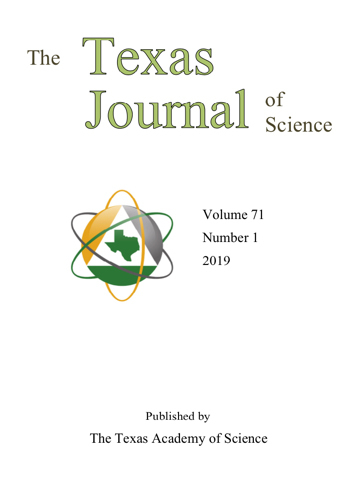 The Texas Journal of Science is a publication of The Texas Academy of Science and is sent to most members and all subscribers. The goal of the Journal is the timely dissemination of research results and scientific information to the scientific community. The Journal is received by members and educational institutions throughout the USA as well as international institutional subscribers. Scholarly papers reporting original research results in any field of science, technology or science education will be considered for publication in The Texas Journal of Science. The geographic scope of manuscripts published in the Journal are generally limited to work conducted by authors while at Texas institutions or to work conducted in Texas or adjacent areas (surrounding states and Mexico) that has some direct relevance to Texas natural history (regardless of author’s institutional location). Papers that are outside of this scope in subject areas not generally limited by geographic context may be submitted by members in good standing of the Academy and considered on a case-by-case basis. In such cases, manuscripts should somehow relate to content previously published in the Journal. The Journal is back on schedule and actively seeking manuscripts. Authors are encouraged to continue to submit manuscripts for publication in the Journal. If all authors are members of the Texas Academy of Science at the time an article is submitted and published, page charges will be waived for the manuscript. Instructions to authors are published one or more times each year in the Journal on a space-available basis, and are available on the Academy's homepage as a link in the main menu.